This has been my favorite place for the last 7 years, I love my Mexican food. The food is great, the price it right and the service is always fast. Have been going here to eat with my family since 1980. It was first across the street as I remember…LOVE their food and don’t know how I’ll live without them if we ever move away! This is the very best food you will eat, No other compares to it. I have been eating here since I went to high school in the 80’s . It is the only Mexican restaurant that we will eat at and the best food around! I was so happy to find a Mexican restaurant that really cares for the customer service they provide, the owners are friendly and quite often are there to oversee the restaurant. The wait staff are tip top, the food is fresh and the salsa is outta site. This is the only one I visit because they make my order just as I ask every visit. Very impressed – food was great and the service was excellent. Even during the very busy lunch rush our server was “on-it.” Drinks were always refilled and the food came very quickly. Felipe’s gets bonus points for atmosphere too, very clean and nice. Looking forward to my next visit. This place has really good Mexican food and I love the rice and beans. Their salsa is good, so is the guacamole, I love that stuff. They also have a place in Citrus Heights, and they are good too. 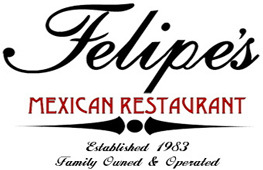 I have gone to Felipe’s in Citrus Heights for 13 years. Last week was my first time to the Folsom location and loved it! The atmosphere is great, wait staff is friendly and always kept our glasses, chips and salsa full. We have been going here at least once a month since shortly after they opened. This is our only regular place. It’s outstanding! I highly recommend the pork Chimichanga – lotsa cheese. While I normally order that, everything else we have tried has been great. The waiter always asks, “the usual”? This has made me try other items and none of us have ever been disappointed. The staff has always been very pleasant, have always been very pleasant.